There is something about taking a girlfriends trip together that is good for the soul. We have taken a couple now, and I'm telling you, it builds stronger friendships and offers a much-needed mom break. 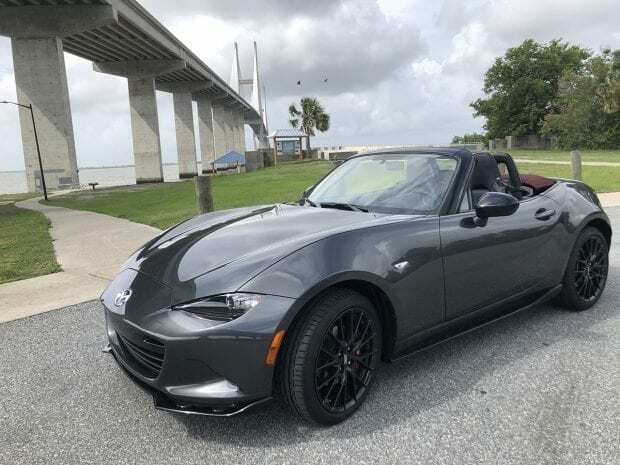 This past month, Krystyn and I loaded into a Mazda Miata convertible to road trip down to the King and Prince Resort in St. Simons Island, Georgia. Thank you to Mazda for allowing me to test the new Mazda Miata. All opinions are my own. The Mazda Miata is a fun little sporty car to drive. We got a manual transmission convertible so that we could make it the ultimate driving experience. We were only going for a long weekend, so we didn't have huge suitcases. It's a good thing because there was no extra room. Before we got on the interstate, we decided to ride with the top down. Our families were tickled about us driving this little sports car. It was even funnier when I told my husband he couldn't drive! The Mazda Miata packs 155 horsepower, 148 LB-FT torque and you can feel it, especially with a manual transmission. Neither Krystyn or I had driven a stick in quite some time because of our current swagger wagons. There were a couple of times that we were giggling up a storm from how much fun we were having while driving. We made sure to use the cruise control on I-16 because the cops are always out there looking to write some speeding tickets. The Miata is equipped with Sirius/XM radio and BOSE speakers, so we jammed out to 90's music the whole way down. I'm in love with the way Mazda has redesigned their console. The screen is huge, and it won't work while you're driving as a safety feature. You have to use a mouse-like feature that is in the center where your arm rests. We explored coastal Georgia in the best way, with the top down and wind in our hair. The weather said it was supposed to rain the whole time we were there but it ended up being the perfect convertible weather. It was nice to trade in the moms-mobile for a sporty convertible. We had a blast driving it and exploring the Golden Isles. My dad’s old car had that mouse feature and it was really hard for me to learn to use!